Director Adam Wingard follows up his 2012 home invasion hit You’re Next with The Guest, another devilishly entertaining thriller that wears its nostalgic horror influences on its sleeve. The titular role is filled by Dan Stevens, most notable for his work on the BBC series Downton Abbey. He plays David Collins, a former soldier who visits the grieving family of his recently fallen colleague Caleb Peterson. When he unexpectedly arrives at their doorstep, he tells of a promise that he made to Caleb about watching over the family and is subsequently welcomed with open arms. During his residency, he begins to subtly influence the day-to-day affairs of Caleb’s brother and sister Luke and Anna, played by Brendan Meyer and Maika Monroe. Whether it’s teaching Luke how to deal with bullies at school or passing Anna shirtless in the hall post-shower, David cool and confident demeanor hints at something sinister under the surface. When Anna begins to probe into David’s shrouded past, David’s charismatic veneer begins to erode and he is forced to defend himself by any means necessary. Dan Stevens is really a marvel in this movie. He somehow channels both the All-American altruism of Steve Rogers from Captain America and the looming, unwavering drive of Michael Myers from Halloween, sometimes even in the same scene. It’s a subtle performance, one where a certain smile or look in the eye can set the trajectory of a scene. The slow reveal of the nature of David’s past creates a tense atmosphere where Stevens is given unrelenting command of the screen at all times. 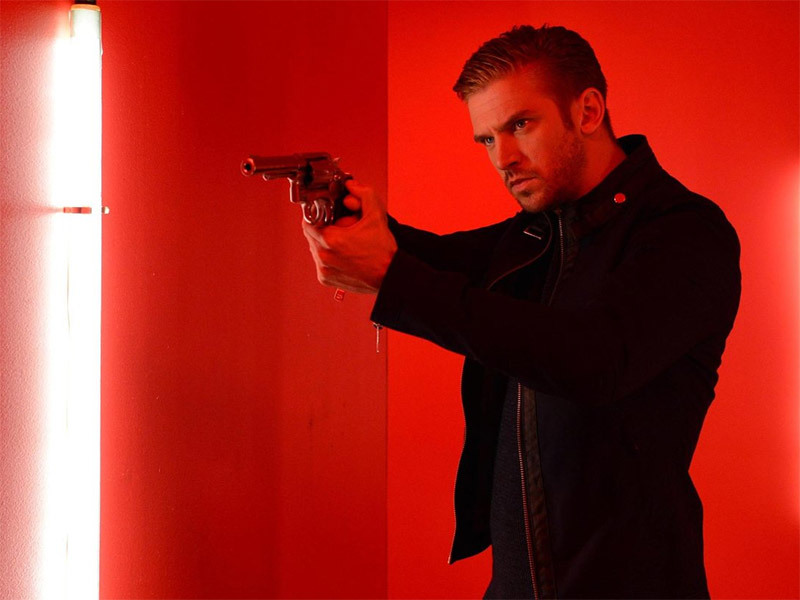 Beyond Stevens’ performance, The Guest is largely style over substance. A mixtape that Anna makes for David serves as the film’s musical backdrop, which features the type of synthed-out arpeggiated electro-pop that wouldn’t feel out of place in a 1980s slasher flick. Shot in New Mexico, the film also flirts with Western templates as well, especially during a parlay scene with Stevens and a nearly unrecognizable Ethan Embry. There’s also a tongue-in-cheek campiness throughout that makes it work effective as a dark comedy. Wingard is clearly a student of Tarantino-style pastiche and is able to blend these elements cohesively. My chief complaints with the movie come down to the third act, which features two large set pieces that (forgive me) tend to overstay their welcome. Save for a memorably funny line reading at its conclusion, it’s as if The Guest forgets how to have fun once the plot wheels start to come into motion. Still, there’s more than enough here to recommend, especially during a fall movie season that’s been light on old-fashioned thrills.